other is a knit/purl rib pattern. Each hat takes two skeins Louet Gems Yarn. Click on the photo for a link to the pattern. Looking for a very easy, but sophisticated scarf pattern? Our Reversible Rib Scarf #2 is the perfect project for mindless knitting that turns into a spectacular scarf. 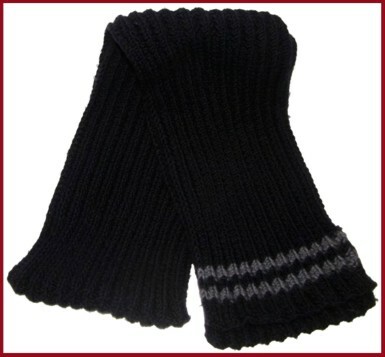 The scarf is a variation of a traditional rib pattern. 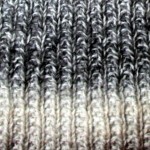 Instead of the familiar k1, p1, this odd numbered pattern creates a knit row, followed by a seed stitch row. The calculations are included for substituting any weight yarn. We knitted this with one of our clearance yarns, Sublime Cashmere Merino Silk DK. The scarf turned out lovely, and so soft that I always grabbed it to wear before any of my other scarves. That is probably due to the cashmere in the yarn. Our next installment of free patterns is actually from one of our blog posts years ago, which was our first Reversible Rib Scarf pattern. Look for that pattern to download soon. Most of my free time is spent taking care of my dogs, and working at my online store. There’s always some new shipment that needs to be inventoried, the photo’s taken, descriptions written, and then put online. But, when my two nephews asked for something hand knit, I was determined to knit them something for Christmas. After looking at many patterns, I settled on two different scarves, each with a reversible pattern. I like the look of a scarf to be the same on both sides, so you do not have to fiddle with how it lays. I settled on acrylic yarn for the scarves because I knew their mother wants wash and wear clothing. 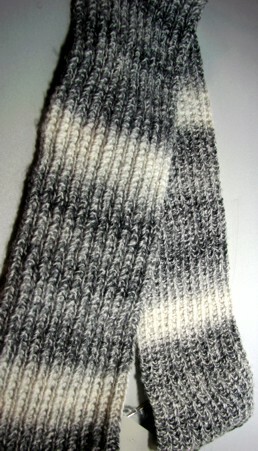 Both scarves are knit with Kertzer Marble, a dk weight yarn. No, we do not stock this yarn, it was purchased some time ago to see if we wanted to carry it. But for these scarves, any yarn will work, just figure out how wide you want it be and calculate the width based on the stitches per inch. The first scarf is a Fisherman’s Farrow Pattern. It’s the black and white scarf. I’m not sure where I saw this pattern at, as there were many variations of it on the internet. The other scarf (the blue one) is the Palindrome Scarf, and that pattern can be found on Ravelry or the designer’s website. One scarf was worked with bamboo needles, and the other with Inox Express (metal) needles. 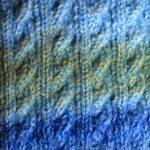 I found that the bamboo was not a good choice for this yarn, and things went much smoother on the Inox needles. I did not switch from the bamboo because I have so many other knitting works in progress that used my other size five needles. The scarves are about 90% finished, so I will make it in time for Christmas. If anyone is looking for a last minute scarf, the Fisherman’s Farrow scarf is so easy that if you start it now you can finish it by Christmas. I doubt that most people starting the Palindrome scarf today can finish by Christmas, unless you have lots of free time on your hands for the next two weeks. It’s not a hard pattern, but that one row of cables slows down the knitting, and for me became tedious. So, I would stop knitting the scarf and work on another project when I tired of knitting all those cables. Row 1 (k2, p1) repeat all the way across. Row 2 (k2, p1) repeat all the way across. You can get the detailed pattern here. It is a very simple pattern. I cast on 52 stitches with size 7 needles, and knit it with size 5 needles, using dk weight yarn. I cast on (and knit) very tightly, so I always cast on with needles two sizes larger than the rest of the project is knit with. 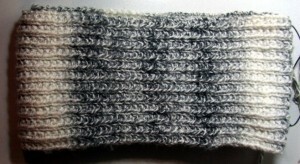 This scarf has a 12 stitch repeat, so to alter its width either add or subtract 12 stitches. It is a six-row pattern. Rows 1, 2, 3, 4, and 6 are the same, (knit 2, purl 2) repeat this all the way across. Row 5 (k2, p2, C8F)* repeat this until the last 4 stitches, then k2, p2. Note: To make the reversible cable, for the C8f, you will slip 4 stitches to a cable needle and hold in front, then k2, p2 from your knitting needle, then k2, p2 from the cable needle. So, even the cable is kept in the original k2, p2 pattern to make it reversible on each side. I knit this scarf for my 9-year-old nephew. It’s interesting how different the two scarves are even though they are knit with the same yarn, and same size needles. 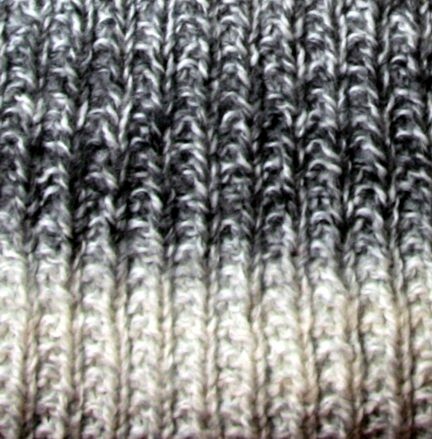 This pattern creates a much thicker knitted fabric. It’s still very nice, but is not flexible like the other fabric. Both are nice, but I probably would not use this pattern for an adult male. It’s just a bit thick for a man. The next time I make it, I think I will make it an 8-row pattern, which will make the cable less dense, and a better resulting fabric. My nephew has already seen the scarf and loves it. After the scarves are finished, I’m going to knit both boys ear flap hats out of the same yarn. I hope to finish the hats by the first of the year. Noro Kureyon Sock Yarn – Going, Going, Nearly Gone! I have recently learned that the Noro Kureyon Sock Yarn has been discontinued in the United States. What’s going on with this yarn in other parts of the world is anyone’s guess. Seeing that the U.S. is Noro’s largest market, I imagine that if the U.S. distributor decided not to continue ordering it, that this yarn may soon be discontinued worldwide also. 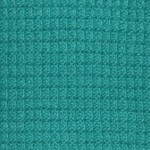 We have eight colors of the Kureyon Sock yarn in Stock, and there are no more than 10 skeins of each color available. Our supply is very limited and selling quickly. To purchase the yarn, visit our Kureyon Sock Page. The yarn retails for $19.00, and we have it on sale for $18.05 per skein. Kureyon Sock yarn is a yarn that I have not knit with before. Actually, I haven’t knit a pair of socks on about five years. When I heard that this yarn was being discontinued, I thought I might want to make a pair of socks before it was gone. I then remembered that about a year ago, one of my puppies got hold of a skein of this yarn, and of course it could not be sold. The puppy didn’t damage the yarn, but it chewed the label and unraveled it a bit. So, I’m using that skein for my first pair of Kureyon Socks. The color I’m using is #149, which is a nice mixture of browns. Although I love this color, I probably would have chosen another color. Possibly, something less neutral, and one with brighter colors. Oh well, the dogs picked this color for me, and it’s still a rather nice color to work with. Noro Kureyon Sock yarn is 70% wool, and 30% nylon. 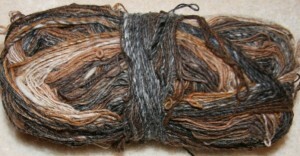 This yarn is made up of two very thin stands of nearly unspun piles that are twisted together. Touching the skein, I noticed that this is not what you would call a per-se “soft” yarn. Just as the worsted weight version of this yarn is not particularly soft, neither is the sock version. But, it is not a rough yarn either. For those use to something really soft like Shepherd Sock or Louet Gems, this yarn might be a bit of a surprise in the “touch and feel” department. Also, it is very thin, much thinner than Shepherd Sock or Louet Gems. I decided on the Waterfall Socks Pattern. This beautiful pattern is free, and was designed by Wendy D. Johnson of wendyknits.net. The stitch pattern used for this sock is very simple and has only four stitches. 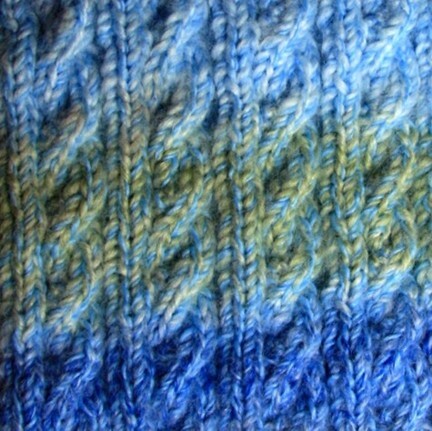 The “waterfall effect” comes from knitting two stitches together, followed by a yarn over. This combination moves one stitch over on each odd numbered row for five rows. This pattern calls for knitting the socks from the toe up, and using the wrap and turn technique, neither of which I’m very fond of. So, I’m knitting the socks from the top down, and using the heel and toe shaping techniques from Evelyn Clark’s Waving Lace Socks. I used six inch Crystal Palace double point needles for my socks. I am a very tight knitter, and have always been so. I started the cast on, and about half way through the yarn snapped. I think the third cast attempt was to my satisfaction. 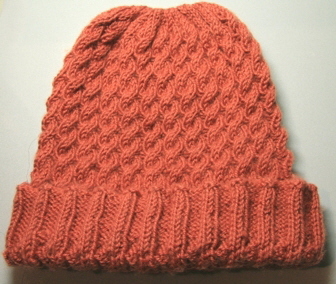 I originally used four double point needles, placing all of the instep stitches on one needle. I later rearranged my stitches and divided them for five needles, as it just worked better. I also realized that six inch needles were too long for such a small amount of stitches. The only shorter double points that I had were Brittany birch four inch double point needles. I found that in size one needles, the Brittany birch needles had much more flexibility than the Crystal Palace bamboo needles. I was a bit worried that I might actually snap the birch needles, so I went back to the bamboo. and here is a picture of the mangled skein. If you click this photo, the larger picture really shows the thicker spots, and how unevenly the yarn is spun. As you will see, I did not rewind it, it’s being used as it. After looking at my blog, and the five years of posts, I realized that not one of them is about something that I am knitting. Actually, with the yarn shop, the dogs, and other obligations, my knitting has been on the back burner. But sometimes I get the urge to knit, and I knit for a couple of weeks. Then, as usual, the project gets put in a drawer and languishes for weeks, if not months. 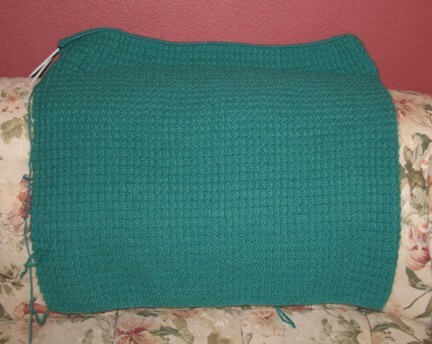 After the very cold winter last year, I knew I wanted to knit a blanket, just in case the power went out again. The warmest sweater that I have is something that I knit years ago in Lopi yarn. It was that sweater that kept me warm while we were out of power for seven days a few years ago. I’m going to call this project the “Blizzard Blanket,” for it’s sure to keep you warm during a snow storm. It’s hard to take a photo of a blanket while it’s still on the knitting needles. 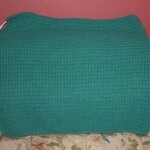 The blanket is folded in half, and I have attached two photos to give you an idea of what it looks like. Click on the photos for a larger view of the blanket. You can use any weight yarn, all you need to do is do a little math calculation. Figure out your stitches per inch times the total width of the blanket, and that is your cast on number. If you come up with an even number add one stitch to make it odd. The hard part is gauging how much yarn to buy. What I do is find a blanket pattern in the same weight of yarn that I am using, and use that pattern’s yarn requirements as a guide for how much yarn is needed. I saw this pattern in Vogue Knitting American Knits . It’s on page 118 if you have the book. 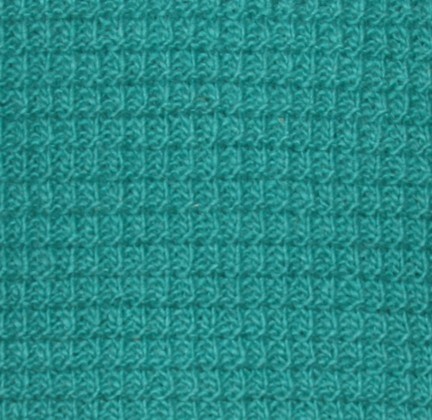 They used much finer yarn, and knit a suit out of this stitch pattern and it looked so sophisticated. It of course looks different in a heavier weight yarn, but still very nice. **The pattern is sized to fit on top of a queen-sized bed at 60 inches wide. The amount of yarn needed is estimated since I am only ½ way finished with the blanket. repeat rows 1-4 to complete the pattern. Cast on 211 stitches with size 10.5 needles. Change to size 10 needles, and begin the Waffle Stitch pattern. 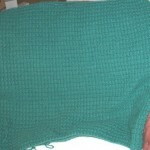 Continue until the blanket is the desired length and cast off with size 10.5 needle. That’s it. There is no shaping or border needed with this pattern. The natural broken rib that is created keeps the fabric from curling. 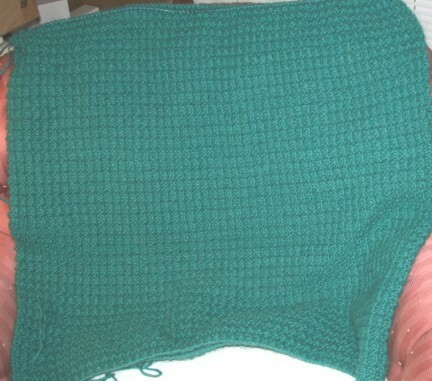 I used my Denise Interchangeable Needles to knit this blanket. I like these needles for blankets because they sell a long cord, and you can simply replace the tips when changing needles. I also like to use the long cord so I can lay the project down flat on the bed and see how it looks and know when the blanket is long enough. This is a project that is best worked alternating between other projects, as I found doing rows one and two can be somewhat tedious. I found myself having to put this blanket down if knitting it for more than a few days at a time. I mean how much knit one, purl one can someone do? You may be wondering why I am using a yarn that is not found on my website. We always planned to add Lopi to our stock, and frankly never got around to it. You will see it online with us hopefully sometime this year. In the meantime, if you want to order Lopi, contact us, and we can special order this yarn for you.